Cheshire East Council is considering two route options for the relief road, named the Green Route Option and the Blue Route Option (see plan attached). Both options will include a shared use path for walkers and cyclists. 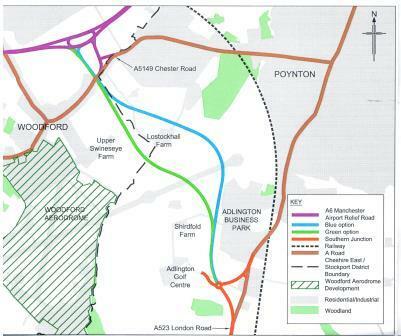 The proposed relief road would run between a junction on the A6 to Manchester Airport Relief Road (A6MARR) immediately north of the existing A5149 Chester Road, west of Poynton, and a point on the existing A523 London Road north of the Adlington crossroads, south of Poynton. The project will also seek to identify and implement localised improvements along the A523 London Road between the proposed relief road and the Silk Road, to the north of Macclesfield. These improvements will help manage any possible increases in traffic flows arising from the relief road and will maintain and improve the safe operation of the highway. How can I submit my views? Exhibitions are being held to provide interested parties with the opportunity to learn more about the relief road options and discuss the project with Cheshire East’s team of consultants. www.cheshireeast.gov.uk/PoyntonRR and complete an online questionnaire.